The legalisation of this 'newcomer’s statement' is an undeniable step on the slippery slope in the dehumanisation of Europe’s ‘new Jews’. Alarm bells should be ringing. 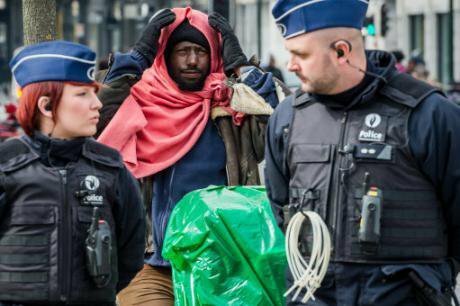 Homeless man, hands on head, in Brussels, April 2, 2016 as Belgian police and soldiers arrest protesters far-left and far-right breaking ban on demonstrations. Geert Vanden Wijngaert/Press Association. All rights reserved.On Friday April 1, 2016, the Belgium federal government approved the ‘nieuwkomersverklaring’ (newcomers statement), a legal document that all new non-European arrivals to Belgium will have to sign if they wish to remain here for longer than 3 months. Sadly, this is no April Fool’s Day joke, but the shame of Belgium. Those who refuse to sign this offensive legal document filled with implicit racism and sexism are not welcome to stay. Details of those who refuse and their eventual deportations are not discussed and yet the legalisation of this possibility should be the cause for great sorrow, not only in Belgium but throughout Europe. What is disturbing is the lack of protest – partially due to the convenient timing of this legislation in the aftermath of the Brussels attacks and the heightened security measures (which permitted neo-Nazis to gather publically at a memorial gathering in late March and refused a similar gathering of those in solidarity with foreigners and refugees). The explicit and unproblematized connection between assimilation and the right to residence, or what Arendt characterised as the basis of all rights, the right-to-have-rights, is a first in Europe. What a welcome to them from us! As the text is now only available in Dutch and French, let me summarise its main points for an international audience. What is expected of those wishing to remain in Belgium is a ‘reasonable effort’ to integrate. The language of integration is here described as a one-way top-downer power-infused process – let us be frank – this is a heavy-handed demand for assimilation. There is no mention of the responsibility of those fortunate enough to live here to welcome the other, to offer hospitality let alone to reflect on or consider the impossibility and undesirability of such ‘integration’. The text begins with a very problematic and un-nuanced account of culture and an explicit polarisation of us and them. “Newcomers, such as you, have been welcomed here for many years and come from countries with very different cultural backgrounds … The inhabitants of Belgium are attached to certain rights, duties, freedoms and values … to which you – and all your children must comply.” What a warm and hospital way to say welcome to Belgium! The document continues by listing these rights, duties, freedoms and values. First the token nod to universal and European human rights, the importance of law, and democratic principles. Without denying the importance of all three political institutions, they are here presented as eternally fixed, uncontested concepts and most importantly as beyond criticism – the irony of course being that part of our supposed freedom is the freedom to question all such political institutions and principles. However – in this document drafted by a renowned ‘moral philosopher’ – our freedoms are four-fold. First is the freedom of expression, which is qualified by reference to the impermissibility of the incitement to violence (implicitly making a link to the recent attacks). Second, the freedom of association which fails to mention how all Muslims and refugees are being framed as associated with the recent rise in violence throughout Europe. Third, the freedom of worship – ironic coming from a supposedly secular state that this would be such an essential freedom – but of course it is qualified with the claim that it is possible not to be religious, the implication being that integration requires giving up your problematic Muslim identity. And the fourth, freedom of sexual orientation and gender equality. This should of course come as no surprise as this document was first drafted in the aftermaths of the ‘Cologne affair’ and as such contains within it the responses we have now come to expect as normal from our right-wing politicians – a rhetoric replete with the framing of all foreign men as sexist and violent. After listing these four essential freedoms, each one is turned into an affirmative statement that begins with “I understand and accept …”. It is also in this section that the document’s implicit sexism and racism becomes nauseating. The drafters took this tragic moment in Belgian history to reaffirm the prejudiced ‘us/them’ frame that will only sow more hate and violence. Highlights from this part of the document make clear who is being targeted and why. In Belgium forced marriages are not permitted. Boys and girls have a right to be educated. Terrorism, and not turning to the police with a complete list of possible suspects, is a punishable offence. And to top it off, this document is being used to remind us of linguistic and neo-liberal policies. Learn the language and most importantly never become a financial ‘burden’ for the state … oh and yes while you are unemployed and struggling to make ends meet, find the free time to follow an ‘integration course’ which is time consuming and thoroughly insulting to your humanity (e.g. you are taught the correct way to use public bathroom facilities). In addition to the morally offensive content of this newcomer’s statement, it is politically problematic. It sanctions and institutionalises, by means of its legal status, a first step in the dehumanisation of the other. While never explicit, it targets Muslims who according to the Flemish premier must ‘Westernize’. This dehumanisation, which Europe cannot pretend does not have the potential to lead to genocide, is a dangerous slippery slope. In order to better understand this shadowy process, Hannah Arendt, a political theorist, tries to distinguish distinct steps in this process in her analysis of the dehumanisation of the ‘enemies of the Nazi state’ (e.g. Jews, Roma, homosexuals etc). In Origins of Totalitarianism, she describes the first step as political-legal in its slow process of destruction, often by means of micro-changes that are each easily overlooked as too minor to be worth protesting, which enables the other to be seen as no longer part of the political community, and the enshrining of this other-ing by means of the legal system. This newcomer’s document, which cannot be detached from the increase in Islamophobia in our current political community, is a concrete example of this first step. This first step as Arendt traces it, is one that is very much connected to rhetoric and linguistic modifications, such as those analysed in detail by Viktor Klemperer in his Lingua Tertii Imperii. Legal codifications are a form of speech acts that create reality. By not challenging this document, both in terms of content and form, we are permitting the basic fabric of our societies to be destroyed. What potentially follows are two further levels of dehumanisation – moral and individual. ‘The killing of man’s [sic] individuality, of the uniqueness . . . creates a horror that vastly overshadows the outrage of the juridical-political person and the despair of the moral person’ (OT 454). The legalisation of this newcomer’s statement is an undeniable step on the slippery slope in the dehumanisation of Europe’s ‘new Jews’. Alarm bells should be ringing; indifference is not an acceptable response.